Animal communication is a key innovation that allows a species to find resources, perceive danger and respond to it as a group. When these interactions scale up into complexity they start to define how the species’ social structure and collective behaviour. When we consider behaviour in ants, we see the management of hundreds of thousands of individuals working in synchronicity to carry out the necessary chores to sustain a colony. What makes millions of individual ants effective? What do we know about animal collective behaviour that can help us understand remote control of the swarms of ants seen in Ant-Man? In 2015’s movie Ant-Man and 2018’s Ant-Man and the Wasp, characters Hank Pym, Hope Van Dyne, and Scott Lang all have the ability to talk to ants using a special “EMP communication device.” This device, an earpiece or built into the helmet of Ant-Man or the Wasp, allows its user to command ants to do a variety of astonishing acts. For example, in Ant-Man, Scott Lang’s first success with the device allows him to instruct four ants to lift a penny and spin it. 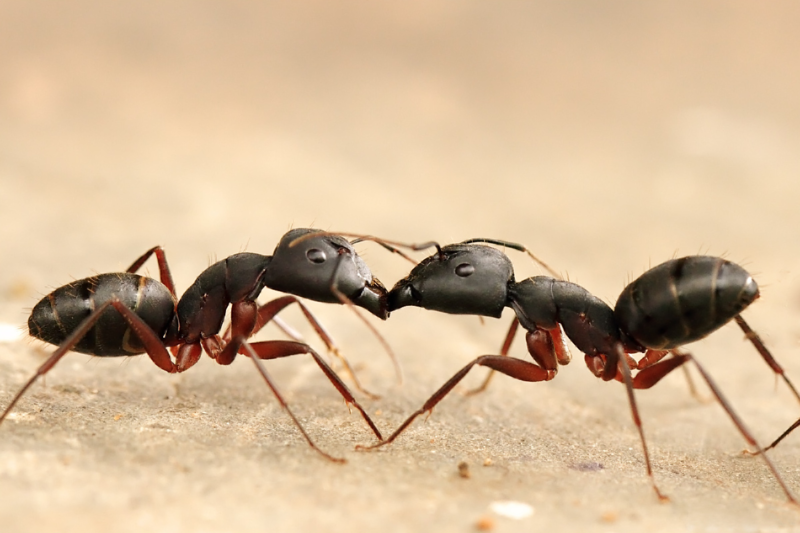 Experienced users are further enabled to instruct ants to carry out some natural behaviours, such as the coordinated formation of bridges and rafts made by fire ants. Users are also able to control ants to carry out behaviours they would never do, such as blocking out lights and cameras, acting as an aerial cavalry, and playing the drums. To read the brain waves of an individual, we need to consider what provides a readable signal. Our brain is made up of 100 billion interconnected neurons that are organised in complex vascularised structures. Neurons are connected to each other through synapses that transmit chemical signals and electrical impulses between cells. The coordinated action of neurons firing and blood pumping to and away from different areas of the brain provides us an abstract representation of activity in the brain. This function can be read with an electroencephalography (EEG) or magnetoencephalography (MEG), machines that read the brain’s electrical activity using an array of electrodes that conduct through your scalp. The information from these electrodes is read as waves, and it abstracts brain activity that can be computationally processed as patterns of activity underlying behaviours or thoughts. While most EEGs work by connecting multiple electrodes across several parts of the scalp, we can speculate that Pym Particles—the movie’s subatomic particles that can change the size or shape of objects—could be used to scale down complex high-resolution machinery into something that can fit snuggly behind your ear. Now that we can “read” the thoughts of a human, how can we tie this to the behaviours of an ant? If you watch ants in nature you’ll notice they spend quite a bit of time “sensing” each other with their antennae. Ants communicate using a combination of body language, sound from scraping their legs and scent trails. The sensory information they receive through their antenna allows them to detect changes in their environment such as temperature, humidity, and chemical signals. Since Pym’s ant trainer uses EMP, we will consider the possibility that Pym’s ants are uniquely sensitive to electromagnetism. Various ant species, as well as bees, are sensitive to the Earth’s weak electromagnetic force. Pachycondyla marginata, for example, orient themselves at 13 degrees Earth’s North-South Geomagnetic axis. In this species, it’s possible magnetoreception occurs when ultrafine-grained crystals of soil-borne magnetic materials accumulate into parts of their antennae. These particles work with the sensory neurons situated in the antennae to signal behavioural changes in the descending neural pathways in the antennal lobe. It would stand to reason that Hank Pym is able to supplement his ants’ environment and food with the necessary iron-based magnetic materials that can increase their magnetic sensitivities. This would enable him to create ants that are highly responsive to his device. In real life, it would be a stretch to think we could take executive control over an animal’s behaviour using peripheral technology (outside of our skulls) reading our brains. EEGs exist, but they don’t provide us with the ultimate answer to how behaviour works or take into account the astronomical complexity of a human brain. An EEG can only really detect electrical activity on the superficial cortices of the brain and cannot read changes that are occurring deeper in the brain. We may understand that a specific part of the brain shows a specific brain wave when it is recalling an emotional memory, but an EEG won’t tell you what the memory was or other salient parts of it. Additionally, an EEG only interprets electrical data signalled from the brain and not the chemical information communicated at the synapses between neurons. Lastly, the human brain is unable to process or abstract the activity of thousands of ants, since it never had to evolve to do so. Humans can barely text while driving; controlling the motor function of a few thousand six-legged creatures may be a little ambitious! Considering the possibility of controlling ants’ behaviour, humans are capable of influencing some of their natural behaviours via experimentation. We can change the rate at which worker ants can forage, but we probably can’t get ants to solve a crossword puzzle. But an individual ant isn’t autonomous, but part of a much larger decentralised “superorganism.” To develop our understanding of animal communication, we can look at different intrinsic and extrinsic signals that can modulate already existing behaviours, like an ant’s ability to forage for food, build bridges or attack an invader. The use of extrinsic signals that can regulate natural behaviours can be seen in Dr. Deborah Gordon’s lab at Stanford University. Her group and work have shown how ant colony dynamics and behaviours can initiate foraging responses. In a colony of red harvester ants, returning foragers lay down a chemical trail of pheromones and interact with nestmates to encourage them to forage. 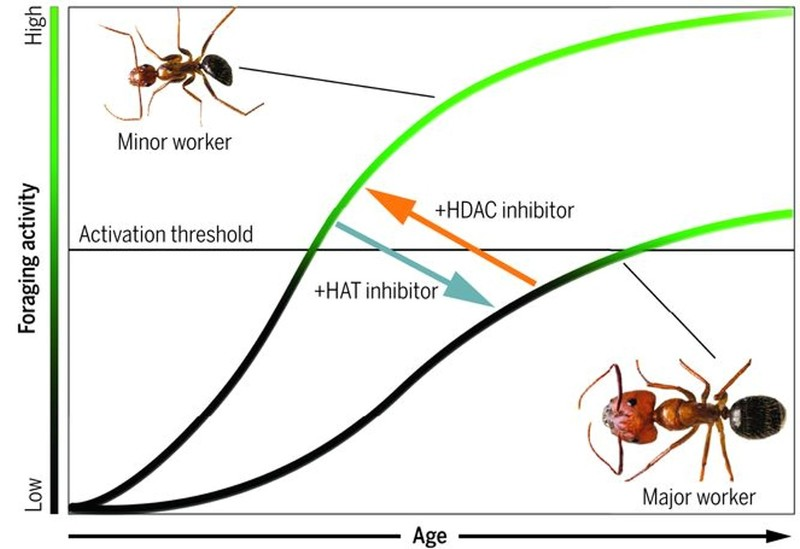 In one study, Gordon’s group emulated these effects by removing the cuticular hydrocarbons of a patrolling harvester ant and coating them onto a glass bead (like a chemical fingerprint that can be read by nestmates). When these beads were placed at the entrance of their nest, nestmates initiated a positive feedback loop to forage for more food. Intrinsic signals capable of modifying behaviours can be carried out by changing the expression of genes that underlie specific behaviours. Dr. Shelley Berger’s lab at the University of Pennsylvania can control behaviour by modifying how genes are packaged and expressed in the nucleus of a cell. Across the animal kingdom, DNA is compacted by coiling it around protein-like spools called nucleosomes that fold and supercoil, eventually becoming chromosomes. Nucleosomes can be reversibly modified to unravel DNA, granting access to molecular machinery that can express a gene. Berger’s group found that many of the differences in gene expression between two castes of carpenter ants were due to differences in a chemical mark on these nucleosomes. Using several molecular and pharmacological tools, her group was able to successfully reprogram the behaviour of a soldier ant, a type of ant that never forages, to initiate foraging runs. These behavioural interactions scale into communities where collective behaviour can accomplish much more than the sum of its individuals. For example, in an experimental setup in the lab, Argentine ants are capable of solving logic problems like the Towers of Hanoi. This is a far cry, however, from being able to command an ant to play the drums or reliably direct their behaviour. A more realistic focus would have made Ant-Man and Wasp’s MCU entries a little less interesting… At least talking to ants makes more sense than bending fundamental rules of physics like Pym particles do. If you’re still curious about the science behind Marvel’s Cinematic Universe, consider pre-ordering Dr. Sebastian Alvarado’s book, The Science of Marvel published by Adams Media, an imprint of Simon &amp; Schuster. Learn how Sebastian has shrunk ants in his research, how to engineer a supersoldier serum and more!